With President Rodrigo Duterte's goal to provide skills training to all Filipinos, the Technical Education and Skills Development Authority (TESDA) has more than 300,000 scholarships to give nationwide this 2017. In Luzon, TESDA eyes 100,000 scholars from National Capital Region (NCR) and Calabarzon (Cavite, Laguna, Batangas, Rizal, Quezon) this year. 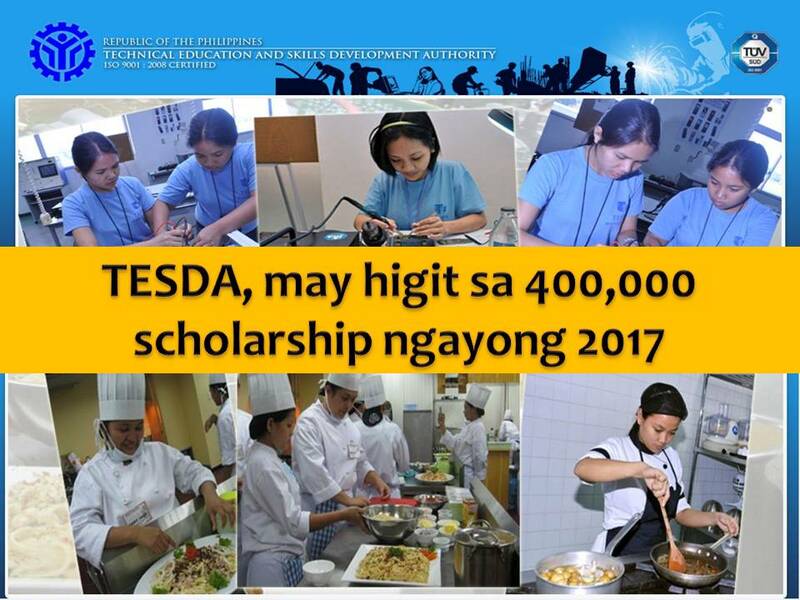 In the Visayas, more than 100,000 scholarships would be given by TESDA in Bicol and Visayas Region. On TESDAs record, Region 5, will be having 32,396 scholars slot; 25,000 in Region 6 and 30,000 from Regions 7 and 8, with a total of 117,396 beneficiaries. In Mindanao, 200,000 scholarships will be opened this year with a budget of P1.5 billion. Of the 200,000 scholarships, 30,000 will be allotted in Regions 9, 11 at 12; 25,000, Region 10 and Caraga; and 60,000, Autonomous Region in Muslim Mindanao. If you want to avail of the TESDA skills training scholarship program, just visit TESDA's provincial or regional office in your area or you can check the website www.tesda.gov.ph. Target scholars will come from the barangay, TESDA district and regional offices in different regions and those who will apply online. Scholars can choose from the different courses offered under TESDA's skills training program. According to TESDA Director, General Guiling Mamondiong said that the scholarship program on skills training aims to help the youth get jobs easily. He added that providing scholarships would also make quality education accessible to the youth especially those who cannot afford to go to college. Recent studies have shown that many employers prefer hiring employees who have skills training from TESDA because they are tested and reliable. So to all who are interested out there, grab this opportunity while it's available and free.